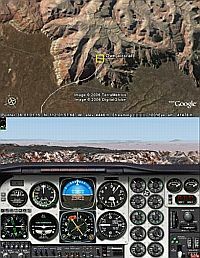 Those of you who read Google Earth Blog know I have a passion for recreational flying and have posted GPS tracks of flights (see examples here and here). Dave Morrissey wrote me to inform me about his goFLYING web site which allows you to upload your GPS flight logs and display them on either Google Maps or Google Earth. 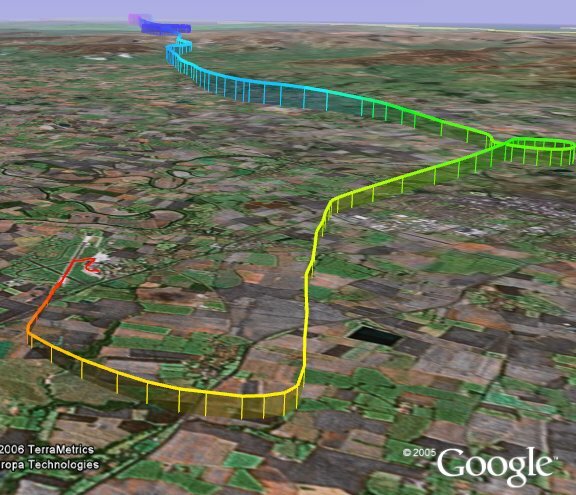 Here are some examples of flight logs, and here is an example of a single flight log for GE. One thing I like about David's implementation is that the flight logs show colorized-by-altitude fenced tracks in 3D, which is a feature GPSVisualizer can do as well. Also, goFLYING is dedicated to just flying and provides some nice graphs and summary information. You could also add to your flight log by also using magnalox's storytelling capability (see example). 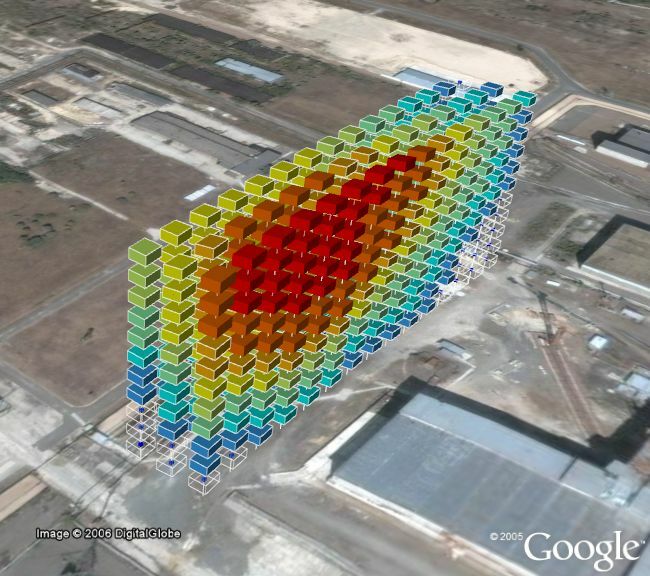 Last week, our friend Valery Hronusov from Russia's Academy of Science in Perm, Russia (aka Valery35 at the Google Earth Community) posted a series of Google Earth files to illustrate radiation quantities at the Chernobyl site. Chernobyl (located in Pripyat, Ukraine) was the site of the worst nuclear power disaster in history and occurred 20 years ago on April 26, 1986 (see Wikipedia story). It turns out Google Earth now has a high resolution photo for the Chernobyl disaster (not sure when that got added). You can visit Chernobyl and see Valery's visualizations below. There are more examples in his post. Valery used a GIS tool he has helped develop called KMLer. By the way, you would think the site of the worst nuclear disaster would be empty of life. But, in fact people work nearby there today. And animals have seen a startling comeback (in the absense of a lot of people living near the site). And trees have overtaken the nearby building northwest of the site. Read this BBC story about it. Another movie promotion uses a combination of an interactive Flash application and a Google Earth file to play a "game" in order to enter a contest. The doyourmissionimpossible.com site says you can win a Triumph Scrambler motorcycle and a jacket worn by Ethan Hunt (Tom Cruise). In this case, Google Earth is just used to provide a rather obvious clue to a trivia question from the movie. They have re-branded the Oriental Pearl Tower in Shanghai (don't worry, they painted just the 3D model, not the real tower) which you can see here . 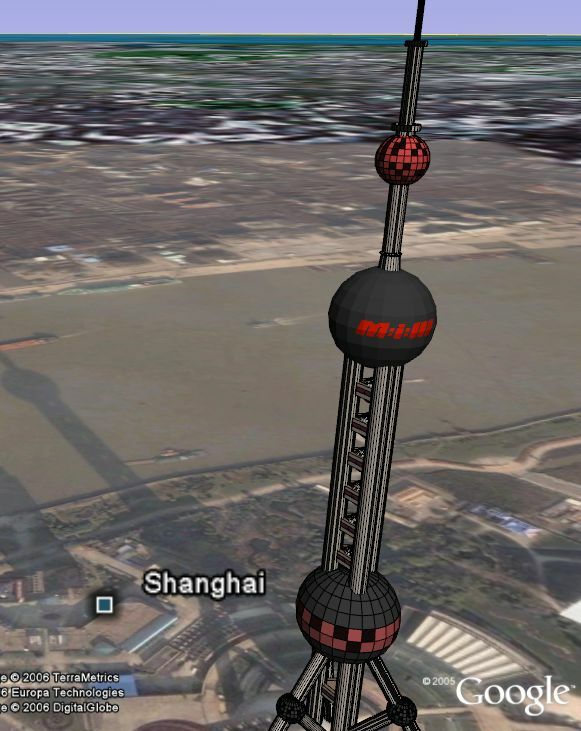 I like this model because you can see the shadow of the tower in Google Earth. It's fun to take popular landmarks and paint them with your own grafitti without hurting any physical property. Maybe we should let gangs turn in their spray paint and give them free copies of SketchUp? This is yet another of the growing list of companies using Google Earth as part of advertising promotions. See the list below for other examples. Last month someone named Jeremy Cothran from the University of South Carolina posted some interesting data at the Google Earth Community. He works with the Carolinas Coastal Ocean Observing and Prediction System (Caro-COOPS), and they have made available a large collection of sensor data for sea and weather conditions. Their focus is with the Southeast US, but they have added sensor data for both North and South America and Hawaii. Jeremy said the data is updated hourly and includes both placemarks with the data in the descriptions, and some image overlays for sea surface temperature and other satellite/radar data (mostly low resolution though). You can download this network link which automatically updates once per hour. Not only are there a lot of data placemarks, but if you click on a placemark and look at the weather data you will see links for the data. If you click on the data you are taken to web sites which provide historical statistics and graphs. See this for example which shows wind gusts for the last several hours at a buoy off the coast of the Carolinas. 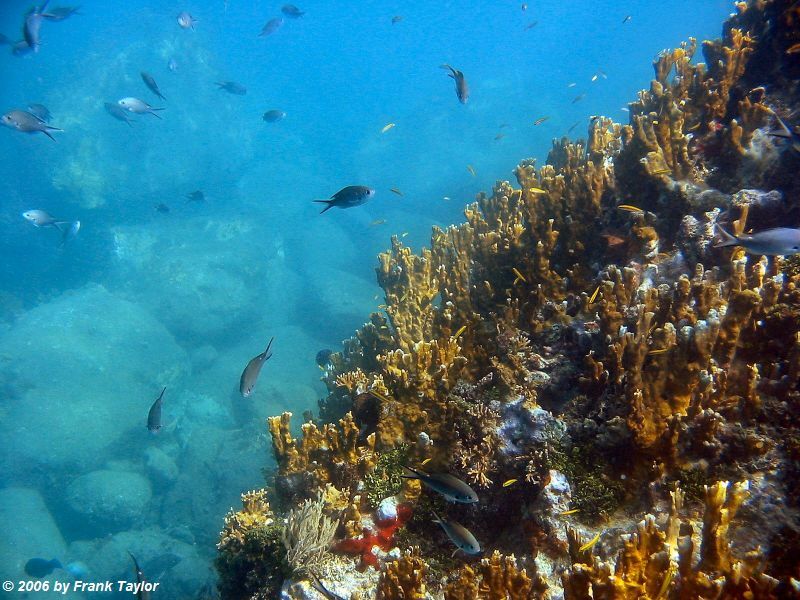 This application is yet another example of growing sensor nets for science which Nature Magazine's Senior Editor Declan Butler has written about. Via OgleEarth. 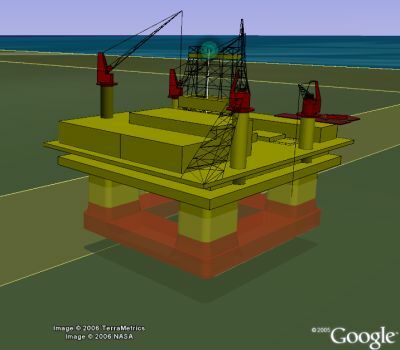 Google SketchUp (beta) - the free 3D Modeling tool for Google Earth - was just released yesterday. As part of that release, Google created the 3D Warehouse which allows you to upload your 3D models to share with others, or allows you to download models or components to make your models better. Another important part of the 3D Warehouse is the 3D Warehouse Network Link . The network link lets you find the models which have been placed onto Google Earth, the placemark descriptions give you a screenshot and details about the model, and give you the choice to download and look at it in Google Earth. You have to pause a couple of seconds for the network link to search and find out if there are models in your current view. Let's see what it takes to place a SketchUp model into the 3D Warehouse. Right now the 3D Warehouse has only a few 3D models placed in Google Earth (maybe 100 or so). 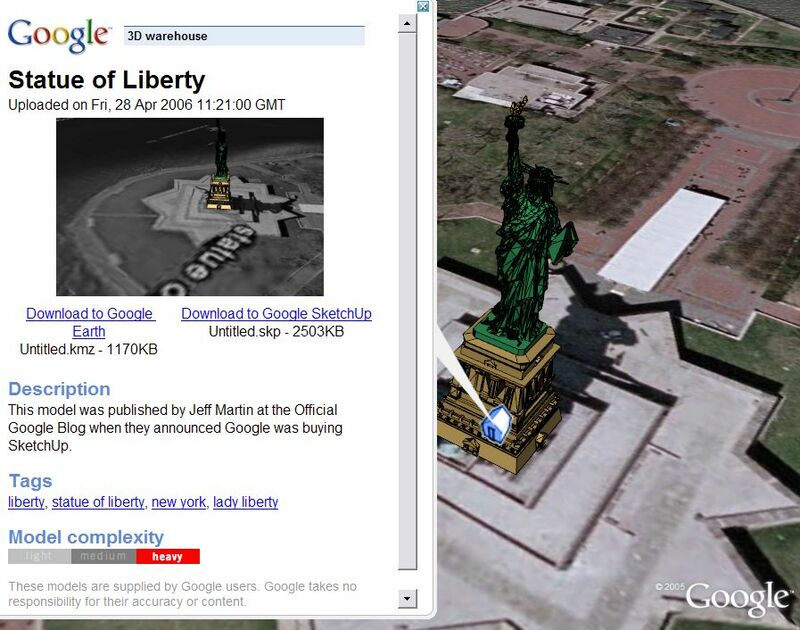 I noticed the Statue of Liberty created by SketchUp was not placed yet. So, I placed it myself as a test. To place a model you need to have Google SketchUp installed on your machine (Windows only at the moment) - download SketchUp here. You also need to have a Google GMail Account to be able to log into upload to the 3D Warehouse. Here are the steps I took to put it into 3D Warehouse. Then I started up Google SketchUp and chose "File->Import", selected KMZ file type, and imported the Statue of Liberty model I saved. This takes a minute or two. Now you have the 3D model in SketchUp. I restarted Google Earth and did a search for "Statue of Liberty". GE flew me to Liberty Island from above. I switched back to SketchUp and chose "Google -> Get Current View" from the menus. This gets a screenshot and location information from Google Earth. I then selected the 3D model, and chose the "Move" tool and moved the 3D model into the correct position. Then I simply chose the "Google -> Place Model" option. I got a browser view allowing me to log into Google Warehouse with my Google Mail account. Finally filled out the short form about the model. It then uploaded the model to 3D Warehouse. If you load the 3D Warehouse Network Link , and type "Statue of Liberty" in the "Fly To" search field, you will now see the placemark for the Statue of Liberty model I uploaded. 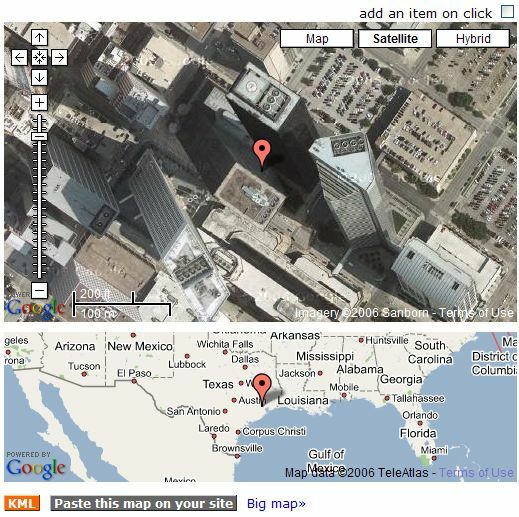 Click on the placemark and choose "Download to Google Earth" to see it yourself. This only took about 10 minutes to accomplish (most of that time was spent downloading, importing, and re-uploading). This process is actually amazingly easy for uploading models in my opinion. Nice work Google! ¡Google Hace a SketchUp Gratuito! Con el clásico estilo Google, el conocido programa de modelado 3D SketchUp ha sido convertido ahora en un programa gratuito descargable.. Hay un SketchUp Pro disponible por $495 dólares con más características. Google compró SketchUp a mediados de Marzo, y mucha gente especuló en su momento que harían una versión gratuita. No creo que mucha gente pensara que, sólo 6 semanas después, estarían anunciando esta versión! SketchUp es un programa popular por la facilidad de su uso que la comunidad de modeladores 3D se ha encargado de anunciar. Descarga Sketchup ahora (la página de descarga dice que la versión para Mac vendrá pronto). Aquí está el anuncio oficial del Blog de Google. Bueno, primero porque es la aplicación de modelado 3D más popular para hacer modelos para Google Earth. Vean montones de modelos 3D para Google Earth aquí. Otro más que interesante desarrollo: Google ha creado una base de datos de modelos 3D llamado el Depósito 3D. Además hay un vínculo de red al Depósito 3D para que se puedan ver en Google Earth, los modelos almacenados. Esta combinación de aplicación 3D gratuita, Google Earth y el Depósito 3D va a hacer más interesante las visualizaciones. Podemos realmente imaginar a millones de personas creando modelos 3D y poblando Google Earth con realismo tridimensional. Sin embargo, no creo que esta combinación produzca rápidamente una réplica 3D del mundo real. La actual versión de GE no es muy eficiente en el manejo de muchos modelos 3D juntos. Una página de Google dice : "Pueden agregar detalles, texturas y vidrio a sus modelos, diseñarlos con medidas reales y ponerlos en Google Earth." Al principio pensé que esta versión gratuita de SketchUp entusiasmaría a la industria de los juegos. Pero aparentemente, esta versión sólo soporta salida para Google Earth. Debes conseguir SketchUp Pro para tener más opciones de exportación. Sin embargo, cuando Google logre poder visualizar muchos modelos 3D de manera más eficiente, esta combinación será muy exitante. Vean este anuncio según la industria AEC News. Over the last few days Google has quietly (no announcements from Google yet 26-Apr: Announcement from Google) deployed a wide range of important upgrades to their Google Maps databases supporting many parts of Europe. Included in the updates have been many additions and enhancements to satellite photos, driving directions for European locations, and road maps to many European countries. Much of this data was added first in the Google Earth databases during the last month or so. 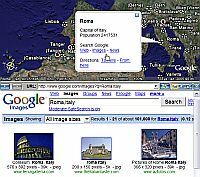 Although many articles have come out reviewing the various mapping tools such as Google Maps, Yahoo Maps and Windows Live Local. The writers rarely compare the maps from a global perspective (almost always US-centric). Google's databases are much more complete from a global perspective especially with regards to satellite photos, and now road maps and directions. And of course, Google Earth's data layers add enormous information on things like airport locations, borders, rivers, 3D buildings, and on and on. Last Friday Google updated the satellite data used for Google Maps so it now has the many updates recently made to the Google Earth database. This means the new high resolution data for all of Germany, many places in Europe, the new 3"/pixel data for Las Vegas, and many other places are now available to Google Maps users. A big part of the change is that, when zoomed out, the Earth's land masses will look more green because Google is now using a dataset from a company called TrueEarth. Big update 23-Mar-2006 - TrueEarth update, Germany, tropical islands, and more. From a Google Maps perspective, only the data updates to the aerial and satellite photos are significant. 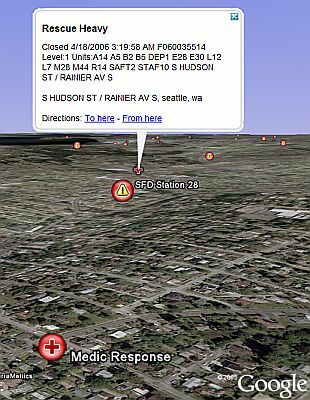 The updates to things like place names you will need to use Google Earth to see. 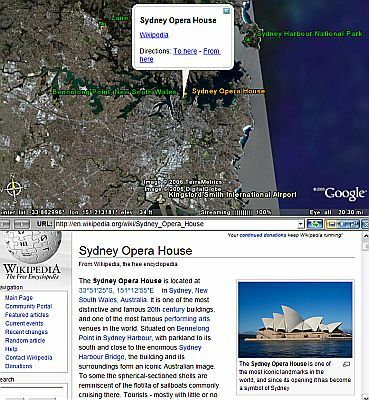 While we are on this subject, OgleEarth points to a hidden feature allowing you to bring up Google Earth for the current view in Google Maps. If you choose the "Link to this page" option in Google Maps after searching for a location, you can bring up the same view in Google Earth by appending "&output=kml" to the URL. Yesterday a David Israel contacted me by E-mail from Bowdoin College. Bowdoin is a liberal arts college founded in 1794 and located in Brunswick, Maine. 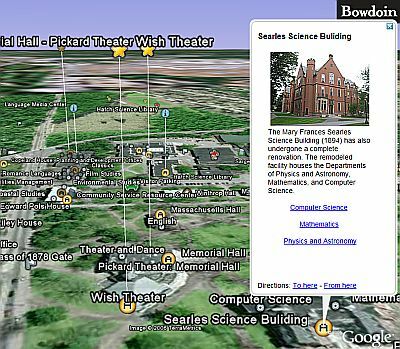 David (who works for Bowdoin's Educational Research & Development Group) created an excellent Google Earth "map" - a very thorough collection of placemarks and a high-res aerial photo of the campus. He recently announced the map at the Bowdoin College Web site here. When you first open the Bowdoin GE map , you won't see too many placemarks. By default he only turns on a few key buildings. But, if you open the "Bowdoin College Campus Map" folder you will see there are lots of choices for buildings, offices, libraries, dining areas, web cams, sports facilities, and more. The placemarks usually include a photo, information, and links for more details. By the way, it took me a minute to find this, so I thought I would share. There's a sizable airport close to the campus, but it isn't labeled in the civilian airport layer provided by Google Earth. So, I did a quick look at Google Maps and found out the airport is the Brunswick Naval Air Station. New Search Feature in Placenames - Cool! A very cool new feature managed to sneak into Google Earth as part of the new data update on 18-April. There are not only many more and nicer appearance for the place names (turn on the "Populated Places" layer), but if you click on the place names there is a new feature in the description bubble. There are links to "Search Google" for "Web", "Images", or "News" for that placename. This allows you to easily find web sites, pictures, or news for almost any city in the world with a simple click. See the example in the screenshot here of clicking on "Images" for Rome, Italy. This new feature also works when you turn on the "Borders" layer, which now also shows thousands of names of islands around the world. When you zoom in closer the names turn into a placemark which you can click and get the same "Google Search" choices. Combine all the web's information with the satellite photos and geo-referenced information in Google Earth, and you've got amazingly convenient information at your fingertips. I particularly like going to tropical islands and checking out the images. Try out Tahiti for example and click on its place name icon and the Google Search for "Images". By the way, the new colored borders for the Golan Heights (orange borders) show an explanatory label along the border when you zoom in close enough: "Ceasefire Lines 1974". And the borders in Kashmir area also have explanatory labels when zoomed in (e.g. "Line of Control (1972 Simla Agreement). I guess these help address some of the disputed border outcries heard after Google Earth started reaching wide audiences. This is an excellent example of changing the interface in very subtle, yet powerful, new ways. 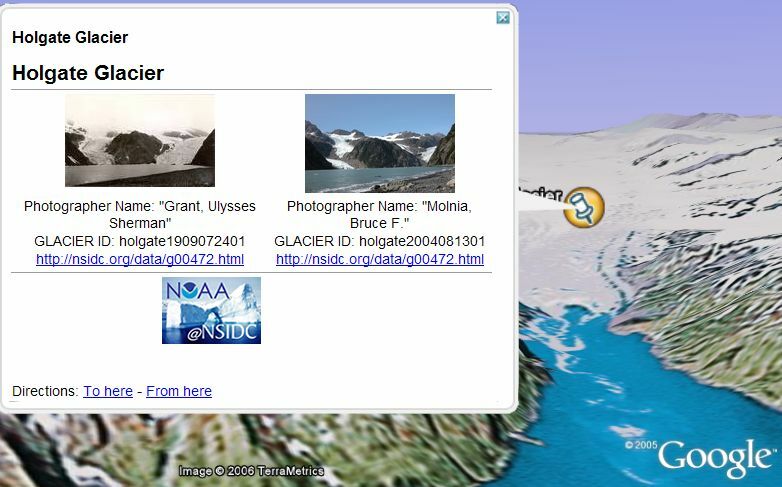 The new search feature leverages the power of Google searching in a seamless way for Google Earth. Kudos to the team at Google Earth who updated the Borders and Placenames layers! GPS-Tour.info is a long-established website based in Germany (with both German and English versions) which provides a resource for those wanting to upload GPS tracks of their various outdoor activities like mountain biking, hiking, horse back riding, skiing, etc. 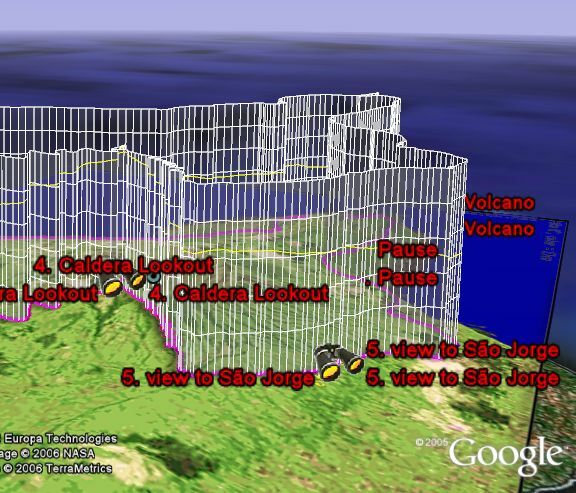 Back in December, they made their collections of GPS tracks available in Google Earth. The advantage being that you can view tracks in 3D terrain and on top of the high resolution satellite photos of Google Earth. If you are viewing a track at their web site, they have a way to view it in Google Earth. They also have a web page which allows you to choose the categories of countries and activity types to narrow the type of tracks you download all of those tracks for Google Earth. Once they download you see placemarks for each track, and the tracks themselves. All with different colors. The placemarks even include graphs showing elevation changes. GPS-Tour.info is similar to resources like Garmin's MotionBased, the Paragliding Forum's GE collection for gliding, and my personal favorite: Magnalox (which has a growing list of very powerful, but easy to use, tools for viewing GPS tracks in a variety of different ways). 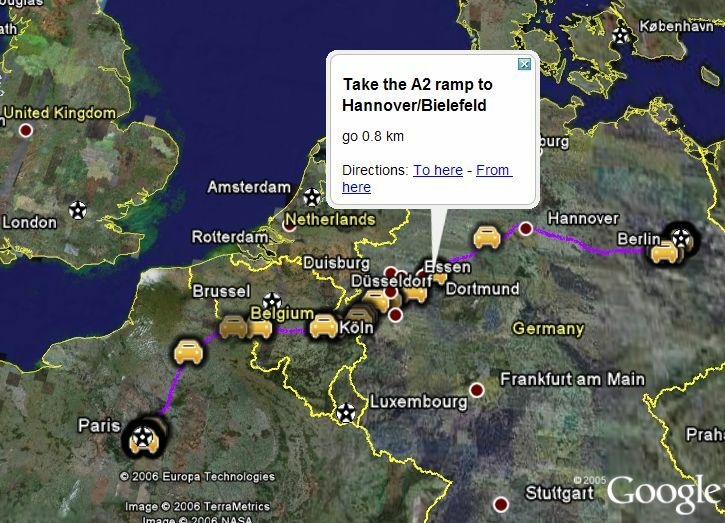 GPS-Tour has quite a collection of tracks (several hundred for their most popular countries Austria and Germany). "Eric E. Schmidt, Google's chief executive, said the market share increase might be related to the use of some of the company's new products, like Google Video, Google Earth and Google Maps, as well as the introduction of Google News in several countries." TravelAdventures.org is a web site which "offers personal travel impressions from over 100 countries in pictures and stories. It aims to give travel advice and travel inspiration." There are many photos and personal accounts of travel all over the world and the site is available in several languages. More importantly, they now have a Google Earth file allowing you to see the sites they have stories about as placemarks. The placemarks contain photos and a brief summary and a link to the full stories at their site. Arc2Earth, an application for converting ESRI ArcGIS content into GE KML content, now has a 7-day free-trial version available. KMLer, another application for converting ESRI ArcGIS content into GE KML content, has a new web site, and recently announced a new version at the GEC. Via OgleEarth. 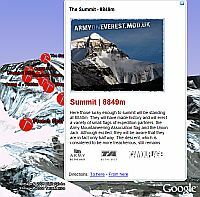 Earthclimber is a web site which uses Google Earth to locate climbing destinations around the world. Via E-mail from its author Toby in Oregon. DigiLondon - this blog about London ties information to location with GE and Google Maps. Via e-mail from its author Lee Rickler. GEB has not mentioned much about NASA World Wind, a free application from NASA which provides a 3D virtual world interface similar to Google Earth. This was because until now you couldn't view Google Earth content in World Wind (WW), and GEB is all about Google Earth. 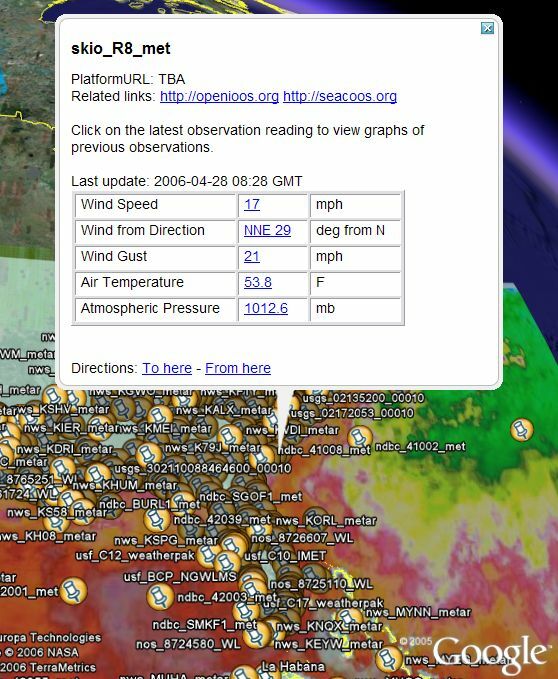 World Wind version 1.3.4 released last night officially supports a plugin allowing you to import Google Earth's KML files including not only placemarks, but also the very powerful Google Earth network link. 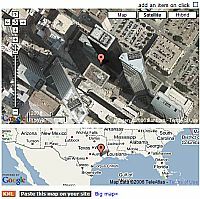 Now virtually all Google Earth files can also be used with World Wind. For Google Earth content creators your exposure has just increased (I'm trying to find out how many World Wind users there are). For WW users, they now have access to literally millions of new placemarks collections and powerful new applications. All they have to do is read about the GE files written about here at GEB, the Google Earth Community forums, or at any of the many other Google Earth-related blogs and sightseeing sites listed in the "Links" collection. World Wind users will not have the ability to see the photos of the millions of objects marked in many KML files. GE provides free access to literally millions of dollars worth of high resolution satellite and aerial photographs not available for free anywhere else in the world. WW only includes freely-available satellite photos from NASA which are usually at much lower resolution, so things like details in downtown Las Vegas are only going to show up as a blur in World Wind's satellite photos. 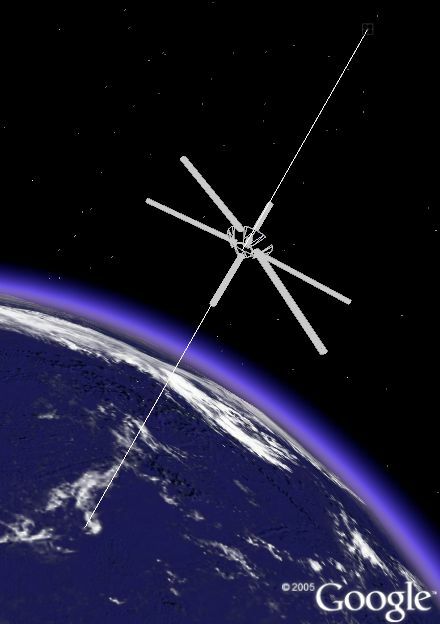 World Wind was developed by the science community at NASA for scientific visualization initially. And it has many visually exciting features for showing environmental and scientific data. Since Google Earth came out they seem to be increasingly adding features to make the tool more attractive to a wider audience. There are situations where you might want to use World Wind because it has some features not found in GE and vice versa. I'm just glad there are even more people out there who will realize the benefits to the GE file format. The British Army has some teams climbing Mount Everest in the Himalayas, and has a nice web site documenting the expeditions. 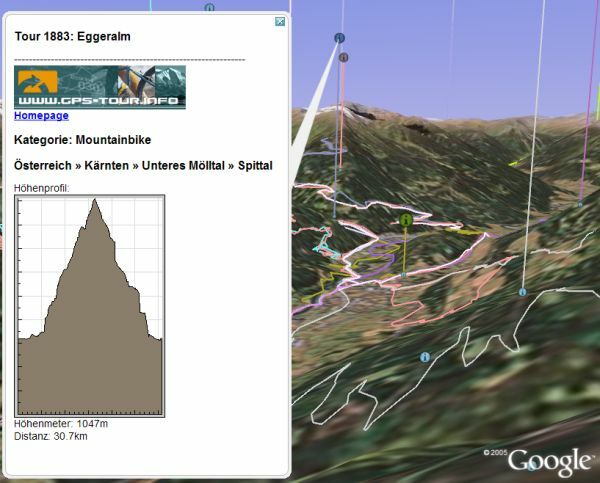 Not only that, but they have created some Google Earth files for showing the routes and positions of the teams. The web site, and the expeditions, obviously are partly designed to aid recruiting - you can get a DVD showing why being in the Army is for you. 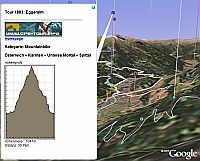 Included in the list of Google Earth files is the route of the main team , and their current position (right now they are at the base of the mountain waiting for weather to begin climbing). Yet another example that Google Earth is a great vehicle for advertising and marketing (see also Adidas, Discovery Channel, King Kong, and Fiat). Via Computer Active. 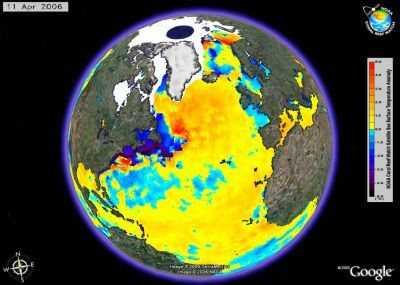 The National Snow and Ice Data Center (NSIDC) has released a web site called "The State of the Cryosphere". The word "cryosphere" refers to low-temperature elements of weather such as ice and snow and includes sea ice, freshwater ice, snow, glaciers, frozen ground and permafrost. As most people are aware, we appear to be in a period of global warming and many parts of these frozen domains are melting. The NSIDC was formed in part by NOAA and has created this web site to help inform the public. Recently the NSIDC has added a Google Earth file showing some of their data including links to snow and ice, permafrost and glacier data sets. You can see they have a few photographic pairs showing glaciers from a few decades ago, and photos now. The amount of glacial melt is astounding. The glaciers viewed from within Google Earth's satellite photos using the 3D panning and tilting gives you some unique perspectives. Via OgleEarth. The Google Librarian Center (a blog by Google for Librarians) recently posted an interview with Mark Aubin, Software Engineer for Google. More improtantly, Mark was one of the founders of Keyhole (the company which wrote the program which was acquired by Google and turned into Google Earth). One of the interesting things is Mark indicates the "Powers of 10" flipbook was what started the idea leading to Google Earth. Check out OgleEarth's comments on other founders comments on the origins of Google Earth. Mark Aubin goes on to comment on the enormous exponential growth of the Google Earth database since he started. He says Google's photos are not just satellite and plane-based aerial photography, but also photography from balloons, model planes, and even kites! He also goes on to say that not only is there a lot of imagery data, but when you combine all the layers of information including the public data (for example the Google Earth Community collections), Google Earth's data sources amount to "hundreds of terabytes". That's 100,000,000,000,000s of bytes. Amazing! As mentioned last night, Google has updated their databases. See the details they announced last night here. There are a number of details not fully itemized in the list. This blog entry will be updated as new items are found by the community. If you find data updates not on this list (or the one announced by Google) please leave a comment here, or leave me a message. NOTE: The planes in flight database is a good way to determine whether data has been updated. When planes are not in the location placemarked it most likely means that photo was updated. 'Cyclonic' maintains that database at the GEC. New AeroData photos in Netherlands have "speckled" data for military sites. I saw this at airport near Assen last night, someone else saw a place in The Hague (52.0785,4.316) [Michael]. Previous data had these sites in the clear. Errors reported by Marc B. in photo placement for areas in Spain. New "unofficial" or "temprorary" colored borders for Gaza strip, moroccan border, Kashmir zones, etc. - See comment from 'draner'. County lines are now seen as green lines when "Borders" layer is on and visiting USA. And the county names even appear at certain zoom-levels/altitudes. Many areas in Eastern Europe also updated. According to 'Szabolcs' in his comment, many more areas in Romania have been added, although big cities are still in low-res. Reykjavik, Iceland is in hi-res now according to 'mucbarney' in the comments. Areas in Bulgaria and Greece added in high resolution. See comment from Stefan. The GE Community Layer has been updated to refine the way the thousands of placemarks appear while viewing in GE. One change is that the labels don't show up until you get closer. This helps reduce the clutter some. The new place names under the "Populated Places" layer seem a bit more refined than the earlier data. You can select what level of population you prefer in the folder. The new "Alternate Place Names" in alternative languages help fix the problem where names that are common in one country's language are provided in parentheses as well for the language you select. Also, there are many islands around the world now named which were not named before. And finally, the new borders data makes it a lot easier to find islands - especially in the Pacific. Just turn on "Borders" layer and you'll see what I mean. New York's GIS organization has provided hi-res photos to Google Earth for several counties that is in this update. Unfortunately, Bergen, Norway's data didn't make it in this data move. 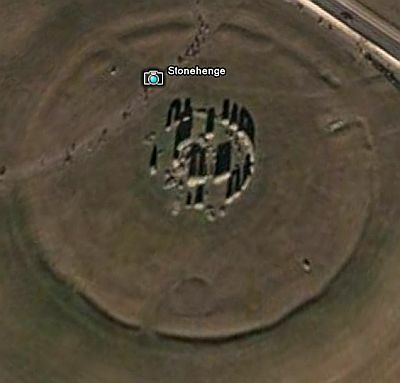 One of the areas not detailed in the update from the 18-April-2006 database update to Google Earth is that Stonehenge and the surrounding area have been updated to a higher-resolution satellite photo. You can now clearly see the stones of Stonehenge. See this placemark for Stonehenge . Thanks to 'Cyclonic' at the Google Earth Community for alerting me to this undocumented update. I will report more analysis of the new data during the day tomorrow. En Enero pasado creé un simple modelo 3D de un elevador espacial para hacer una demostración de modelos 3D. Dos años atrás, alguien de la Comunidad Google Earth llamado 'Gerardo64' publicó un resumen muy bien escrito sobre qué es este concepto de elevador espacial, así como también un modelo 3D más sofisticado del elevador. 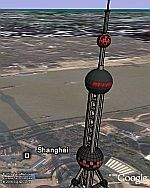 Pueden descargar el Elevador Espacial 3D para Google Earth aquí. Este modelo está hecho con una base flotante en el medio del Océano Pacífico. Por lo que cuando acerquen la imagen, no verán la imagen de ninguna isla. Me pregunto porqué la base no está a la altura del Ecuador. 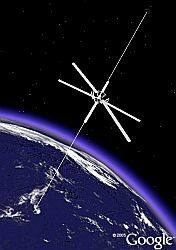 Si nunca han oído acerca del elevador espacial, les sugiero que lean tanto el post de Gerardo64, or como este artículo de Wikipedia. Del artículo de Wikipedia: "Los elevadores espaciales son a veces llamados también puentes espaciales, ascensores espaciales, escaleras espaciales o torres orbitlaes...Un elevador espacial es una estructura hipotética diseñada para transportar material desde la superfice del planeta al espacio." The Island recording group "Thursday" has announced a new scavenger hunt and online forum for music fans to gather and share information and photos from and with Google Earth. According to the announcement, fans can travel in Google Earth and find "any past or future tour dates". Here's the Thursday web page with the information on how to participate and sign-up for the forum. Eye in the sky advertising isn't just the domain for corporations. 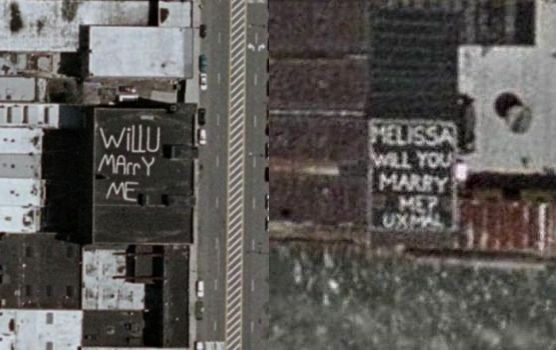 On some roofs in New York City are a couple of marriage proposals painted on roofs which are visible in the aerial photography in Google Earth/Maps. Apparently some people want to proclaim their love to the heavens. The photos are probably two or more years old (taken long before Google Earth was released). But, nearby sky scrapers probably increased the chance they were seen by their intended spouses. Also found was a proposal in a field - this one probably required a plane to be seen. Here is a collection of placemarks showing three proposals to the sky. One says: "Melissa Will you Marry Me?" 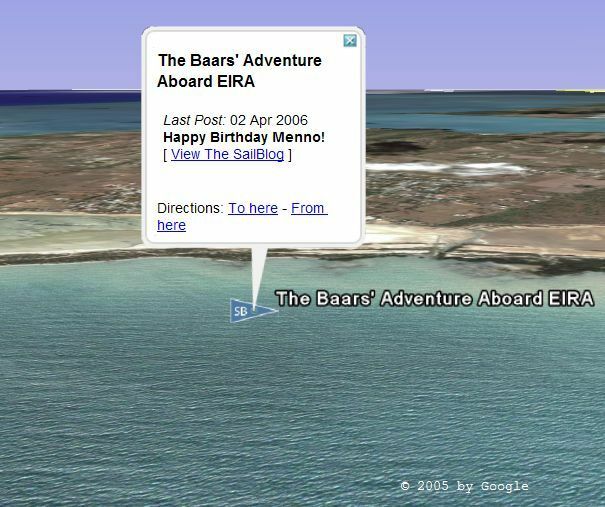 (posted by PhilVerney at the GEC - Google Earth Community) and the next just says "Will U Marry Me?" (which was posted at Digg by 'speel' - see it in Google Maps as well). The third one is actually in a field north of Albany, New York and says "Marry Me D" (posted by 'Racer_S' at the GEC - Google Earth Community). If you know of, or find, other locations in Google Earth showing proposals in the sky, leave me a comment and I'll add it to this collection of placemarks. 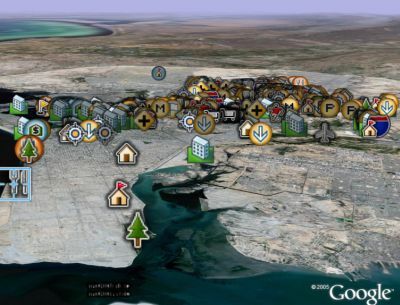 For a few months now, a Google Earth Community member known as 'Xaidi' has been refining his collection of placemarks for Karachi, Pakistan . The collection has over 550 points of interest with different placemark icons according to categories such as: sports, dining, schools, shops, mosques, and more. This is a good start, and since Karachi has some nice high resolution aerial photos you can see the city in detail. 'Xaidi' also has compiled interesting details and photos about the city in his post (updated today). Hopefully he will start adding some pictures, description details and/or links to more information in his placemarks. This is just one of several collections of placemarks for points of interests people are creating for their cities. First, Rhinoceros is a company specializing in modeling tools for designers in industrial, engineering, CAD, and even jewelry areas. They have announced that Rhino 4.0 now exports 3D models to Google Earth. I'm looking for an example. Second, a while back I was contacted by Vinny Fiano who has produced an export script to Google Earth for blender which is a quite serious open source 3D modeling program. BP's Thunderhorse Oil Rig - Gulf of New Mexico, by Joey Wade. See post at GEC. Interesting model with "water" option to hide submerged portion. Radio/TV Tower - Moscow, Russia. By 'spanishflyer' at the GEC - a nice first time post/model. He chose to model the tower with the night-time colors. Photos of real tower in his post, here's the night time photo. Villa Savoye - Poissy, France. This interesting house posted by 'pivnice' at the GEC. Eames House - Pacific Palisades, California. Another interesting house posted by 'pivnice'. Oriental Pearl Tower - ShangHai, China. This is an interesting looking tower, and modeled well by first-time poster 'embont'. See his post for a photo of the real tower. You can see the shadow in Google Earth. Car Spindle - Berwin, Illinois. This model shows a "sculpture" of cars stacked on top of each other by artist Dustin Shuler. Modeled by 'pivnice' and posted at ZNO. Here's a link to see the real car sculpture. Last night Yahoo! Maps beta released 1-meter/pixel resolution color satellite photos for the entire continental US. This is significant because it is more consistent data instead of the patchwork of varying color, black and white, varying resolution imagery we are used to in other mapping applications like Google Maps/Earth, and Windows Live Local. Yahoo! now has the best medium resolution dataset for the entire continental US. According to Cartography the initial release of Yahoo's beta has some problems in that the imagery is too dark when zoomed out. So, while this is an improvement for many areas, Google Earth still has most populated areas in the US (and other parts of the world) at much higher resolution than 1-meter/pixel. In fact, many in GE are at 1-foot/pixel and even 3 inches/pixel. But, a lot of people are going to run there to see if their houses (which weren't in high res in Google Maps/Earth) are now available at Yahoo! Maps. What I'm hoping is that this will put some pressure on Google to speed up the release of more high-resolution data in Google Earth. For those who enjoy finding planes in flight, there's a whole US worth of new data - it's just not in Google Earth. For those in the US who have been frustrated with low-resolution data, this is an improvement. 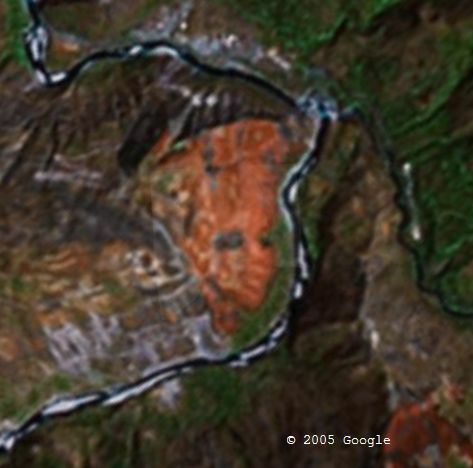 Nestled in the red clays of the Andes Mountains, near a canyon river, is the face of a woman as viewed from space. 'jpwade' at the Google Earth Community, who has appeared at the GEB multiple times for his 3D Models, created this nice Google Earth file to help illustrate this amazing sight. Make sure you turn on/off his translucent image overlay which is used to help visualize the face. If you have grown bored with the man in the moon, or my favorite the lady in the moon, then you should check out Google Earth. There are many visual anomalies like the Apple Ipod, face of jesus, and of course the flying car. Check out some other contributions by 'Up_the_Spurs': US Medals of Honor Recipients, MLB World Series Winners, Victoria Cross Recipients, and Heavy Weight Boxing Champions. Frank McVey is the guy at the Google Earth Community who for several months supported the planes in flight collection of placemarks. Being a serious aviation buff, last October he started a thread at the GEC about a favorite old aircraft of his called the Lockheed Constellation (wikipedia), affectionately known as the "Connie". The Connie flew trans-oceanoc flights after WWII for TWA and was also modified for military applications including reconnaissance. In his thread, Frank McVey asked people to report to him when they found a Connie in Google Earth's satellite and aerial photos. He has been writing individual stories about each Connie found and placemarking their locations. Each placemark includes details about the prior history, and current condition of the aircraft as well as marking its location for viewing. 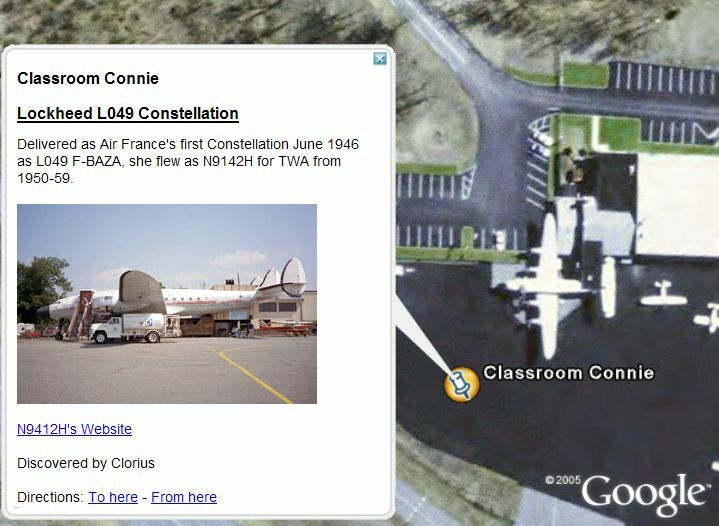 Here are a few examples: Classroom Connie , Dutch Connie , and McClellan Aviation Museum Connie . You can see the entire Connie thread at the GEC here. Last fall I wrote about the GEC member 'Hill's collection of placemarks for DC-3s found all over the Google Earth. There have probably been many more finds since that story was published. GE is such an amazing tool for this kind of activity! Stefan Geens over at OgleEarth spent some of his time this weekend experimenting with 3D models and the skyline of New York in Google Earth. First he downloaded some 3D models of the old World Trade Center buildings. He recreated the scene, from his apartment building, where he witnessed the burning of the World Trade Center on 9/11. With the GE "Buildings" layer turned on, it's amazing how accurately the Google Earth view matches the photo he took. Then Stefan included some other models he got from the Google Earth Community. He downloaded the new proposed Freedom Tower and the Burj Dubai (under construction now, and will be 700 meters tall and clearly the tallest building in the world). For comparison, he placed the Burj Dubai next to the proposed Freedom Tower (from the new WTC design) so you can see how they would look in the New York Skyline. You can download all these 3D models here (580K). I recommend you read Stefans remarks and comparisons, as well as the credits for where he got the models, in his OgleEarth blog entry. Donghai Administration - Jiangsu,PR.China. 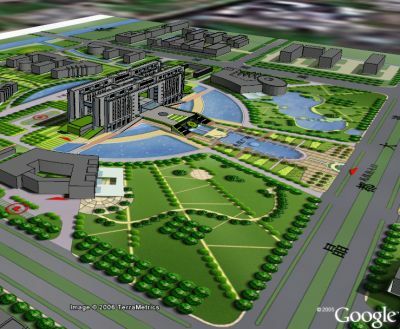 Posted by 'vinh' at GEC who says they won a competition at their local Architectural Research Institute (Chinese). 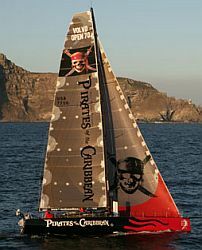 This is the model pictured. Jewish Museum, Berlin - This is a very unique building. 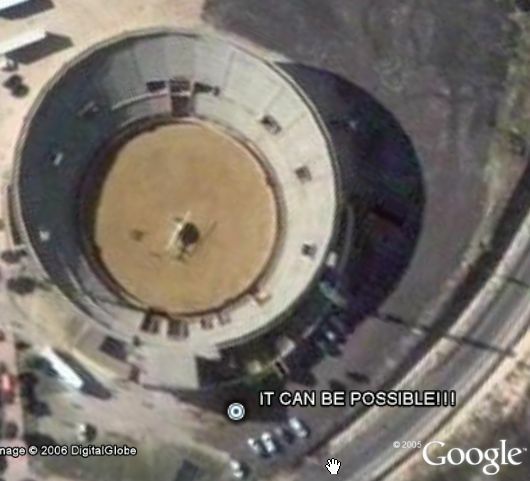 Read the background posted by 'pivnice' at the Google Earth Community (GEC). Castle Karlsruhe - Karlsruhe, Germany. Posted by 'MadMichi' at GEC - a nice first post. Leaning Tower of Pisa (1.5 MBytes) - An easier download than the one I linked to last week. Posted by 'pivnice' at GEC. Palm Islands, Dubai - This is a link to ZNO's post which provides links to several models for this unique "housing development" project off the coast of Dubai. See the PALM web site for details on the site. Avian Flu Weekly Update - Download, and save in your "My Places", the Avian Flu network link to get these updates automatically. Read more about the Avian Flu data. TWA 800 Analysis - Some serious analysis, using Google Earth to visualize, showing further evidence in favor of a missle having shot down TWA 800. Via OgleEarth. World's Largest Gold Plated House - This house, a six-story replica of the Great Pyramid, is located near Chicago. Read the details at Googlesightseeing.com. Leaning Tower of Niles - Another oddity near Chicago from Googlesightseeing. 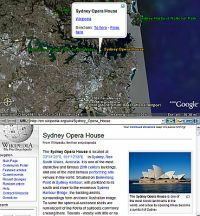 Google Earth on Linux Using VMWare - Another method for running Google Earth under Linux with emulation software. If I read the article right, you can use the 30-day free trial version of the software to run GE under Linux. Reports indicate it works better than with WINE. An appropriate topic for the weekend. I was contacted by Tom Utley who has created a collection of placemarks for bars in Atlanta on his Atlanta Bar Blog. Yesterday the Discovery Channel announced a collaboration with Google Earth to show links to some of its videos. The initial set of links are for videos about National Parks. The first place I saw the collection was on the Google Earth download page. The Discovery Channel's National Parks collection can be downloaded here . The collection is for parks only in the US. The placemarks descriptions are very well done with nice blue description bubbles, logo, nice photos, and links to information on their web site. Most of the videos are two to four minute clips. Considering the amount of media attention, you would think this was the biggest collection of information ever done for Google Earth. There's actually only 10 links. Hopefully, they will add more links soon, and it will have more of a global focus. According to OgleEarth, the Wall Street Journal reports that Google Earth will eventually have the Discovery Channel collection as a Layer in GE. Hopefully this won't happen until they get many more links to videos of stories all over the world. I'm glad Google Earth is getting more attention from this, but I'd like to see more from this partnership. The earthquake stuff USGS put out yesterday was much more impressive. In celebration of its 100th issue, Maxim went into the desert and laid out a huge copy of one of its more popular covers (picture of Housewife Eva Longoria on the cover). They then took aerial photos of the project and created image overlays so you can view it in Google Earth . 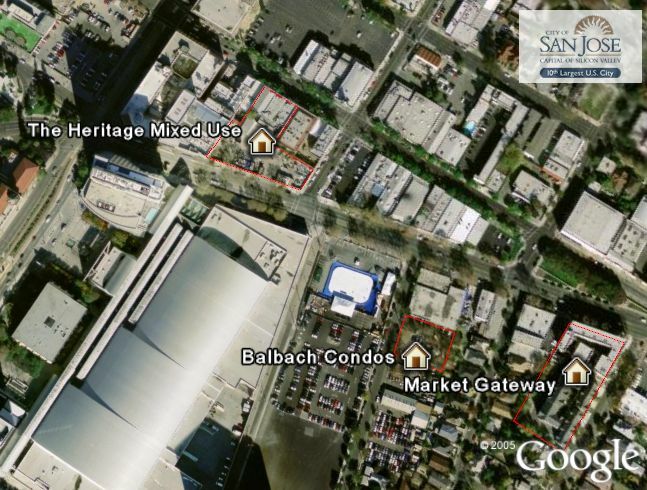 I guess they couldn't wait 2 or 3 years for Google to buy a satellite or aerial photo and include it in their database. According to Defamer, it took them 15 hours to lay it out with 9 people, 25 hours to print out, and 125 stakes to hold it on the ground. 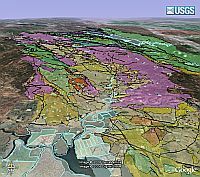 The USGS has developed a truly definitive documentary web site which uses Google Earth as the primary visualization tool in honor of the 100th anniversary of the 1906 Earthquake which devastated the San Francisco Area. The web site walks you through several segments describing various elements of the 1906 Quake and also the hazards and current conditions of the San Andreas and Hayward Faults today. 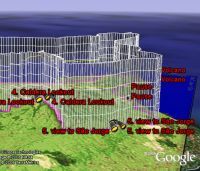 Each segment includes a Google Earth KMZ file which includes a layer of visual information illustrating that segment. The USGS goal is to not only illustrate the most damaging earthquake in US History, but also to visualize and understand the causes and effects of this and future earthquakes. 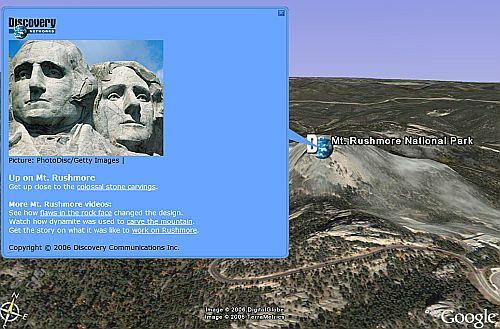 Included in the visual elements are many Google Earth files, which I recommend you view along with the web site starting here. 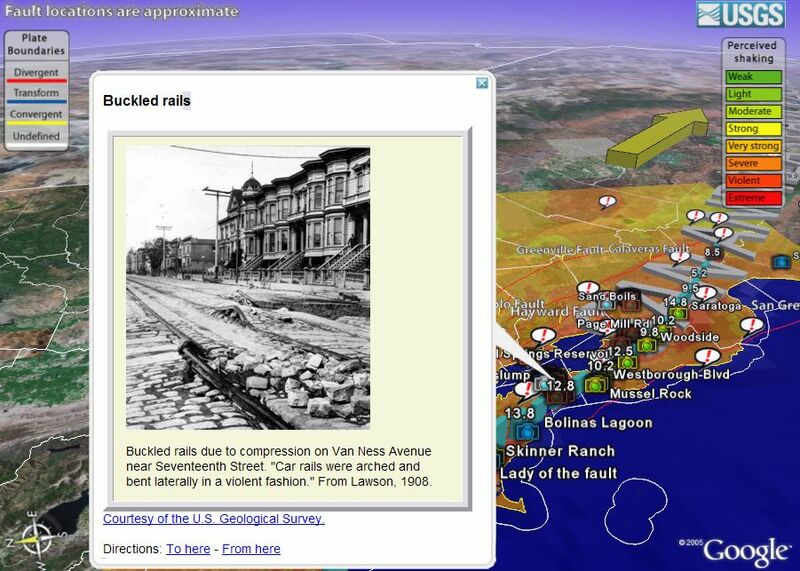 Here are sample of some of the more interesting ones: location and extent of the faults and the 1906 quake, historic photos of the 1906 quake, 3D model graphs showing the rupture length and slip , a shaking intensity map overlay, and illustrations showing the hazards of the bay area today and susceptability to conditions which might cause serious damage to structures. Also check out the real-time earthquakes network link. 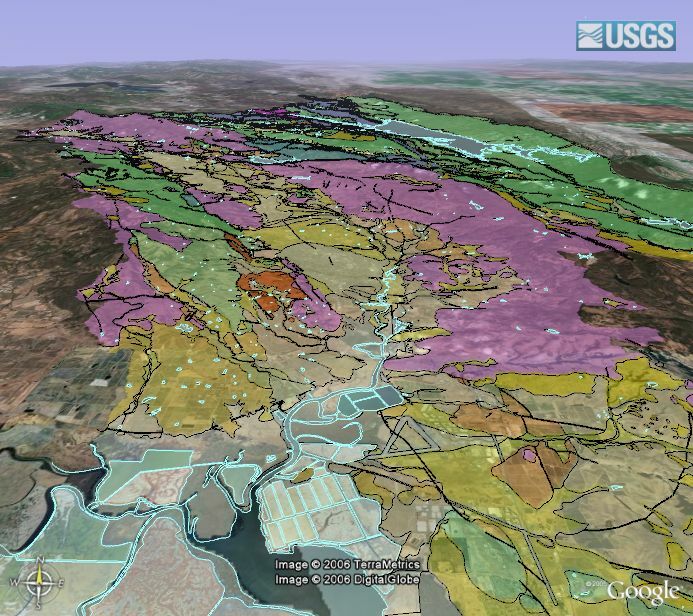 This product was produced by the USGS Northern California Earthquake Hazards Program, Luke Blair, a geologist and Director of the USGS Geographic Information Laboratory, presented the new documentary at a press conference (inlcudes link to video of presentation) today. Last week someone wrote me about their release of FSEarth - an add-on for Microsoft Flight Simulator 2004 (MSFS) and Google Earth (GE). This US$9.95 program allows you to interactively watch your aircraft in MSFS simultaneously in GE. There is a trial-ware free version which lets you fly in a limited area of Alaska, but the author was kind enough to let me try a full version. The install process is fairly simple. You download a file, run a setup program which installs the files in your MSFS folder, start up MSFS and start FSEarth from the Modules menu, and use the FSEarth menu to start up Google Earth. 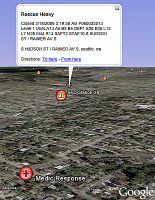 FSEarth uses a network link in Google Earth to communicate with MSFS. Once you have things started and your plane moving in MSFS the plane position is shown and a GPS-like track is shown in GE. There is an interface for controlling the appearance of the camera in GE, and you can control how often the updates occur in GE. Performance in MSFS suffers if you update GE once a second. However, updates every 4 seconds or so seemed much more fluid. FSEarth also lets you run the GE part on another coputer on your network, which greatly improves performance. While you're flying, you can turn on layers in GE to see interesting information not available in MSFS. The author notes that scenery designers can compare notes with the real world with this tool. In late February, I wrote about FSPilot V1.4. And, the first MS Flight Sim interface for GE was released last summer, which also let you see other (auto-generated) airplanes in MSFS. But, as I predicted back then, we continue to see more applications allowing interaction between MSFS and GE. The US Geological Survey (USGS) has released a press advisory in advance of a video conference to be broadcast live 06-April-2006 at 10:00 AM PDT. The advisory says they will be demoing a "Virtual Tour of the 1906 earthquake" which will be released to allow the "public an opportunity to interactively view both historic information and up-to-the-minute science and hazard information on the most damaging earthquake in U.S. history". This was done for the 1906 Earthquake Centennial Alliance (the anniversary is April 18 according to the Wikipedia story on the quake). A link to the video is provided in the advisory and a link to the future archived copy of it is provided as well. Thanks to Gary at Ask.com for e-mailing me about this. 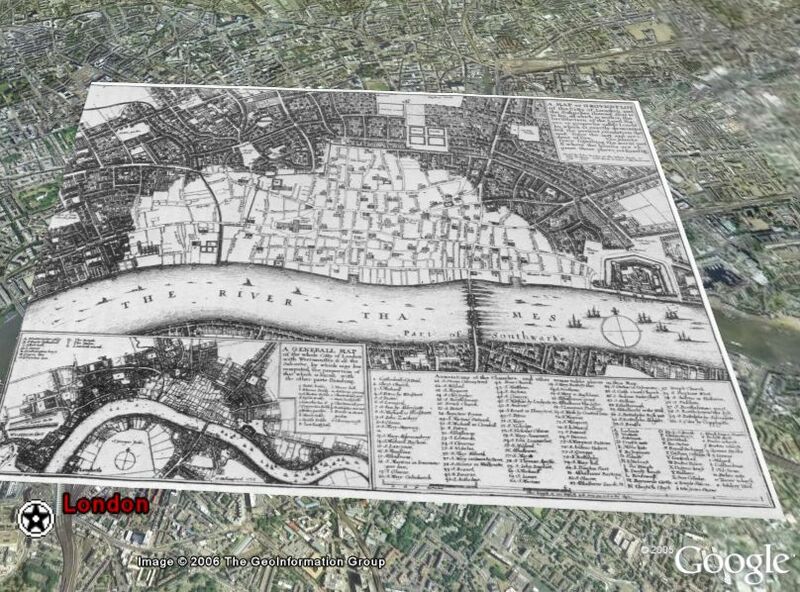 Dr. Andrew Hudson-Smith has posted a blog entry at Digitally Distributed Environments with an image overlay for Google Earth showing a 1666 map of London. You can see this map overlay from 1666 , and you can also compare it to the one he posted earlier for London in 1690 . Also at Dr. Smith's blog, is a really interesting entry about new technology for capturing a 3D city. They have created a movie you can watch showing preliminary results which is just really cool. Here's the movie (Windows Media Player format, 4MBytes) The technology used is Raw Lidar Data (Light Detection And Ranging) - see Lidar.com for more info. It reminds me of side-looking radar only with better resolution. This kind of data is not ready for GE use yet, but it won't be long before future versions of GE start looking much more like reality. Here is a blog entry on other buildings from Dr. Hudson-Smith. One issue with the current version of Google Earth is you can't show subsurface information. GE doesn't let you show data below its 3D rendered surface. So, for example, showing underground geological features, or wells for example. Valery Hronusov from Russia's Academy of Science in Perm, Russia has come up with an interesting innovation. 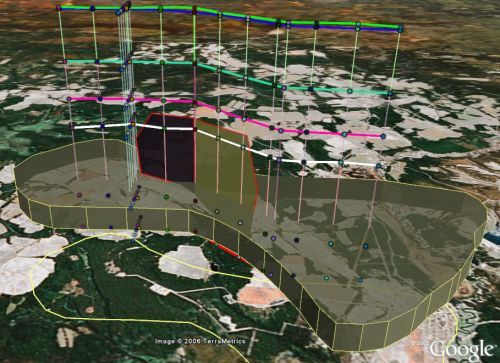 He has used his KMLer application to convert a GIS dataset showing an oil repository and related information. His innovation is to show the sub-surface data above the site where it is located underground. Valery is a very innovative guy with lots of interesting data at his fingertips. You can see other interesting works by Valery: NASA data here, here and here; tracking birds; and other GIS data. Sketchup Tutorial - a brief tutorial on creating models for Google Earth using SketchUp from Sunny Boy Blog. World Wide Panorama V3 - Release 3 of the WWP project. Post at GEC. Google Earth Used in 24 - Popular TV thriller show 24 shows GE being used in an episode during season 5. Of course, a terrorist is using it. Also, a link here to a page where someone used GE while watching 24 to identify scenes in the show. Gallery of GE Stereoscopic 3D - just screenshots, require red/blue 3D glasses. GELessons.com - This website is a collection of links to tools and tips for Teachers wanting to use Google Earth in the classroom. It points to other Teacher resources like JuicyGeography which I've written about before. Google updated their KML 2.0 docs and gave them a new URL late last week. Included are typo corrections, some missing tags added, some clarification on things like styles. 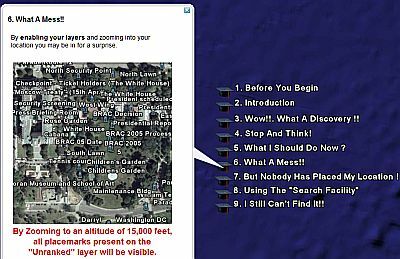 This will help those of you who like to get your hands dirty on the underlying Google Earth features. The post by 'ink_polaroid' at the GE Community indicates new tutorial docs are also being worked on by their "fearless documentation guru". This KML doc update is not a big update, but should make it easier for them to do further updates in the future. Maybe a new version is coming? Traffic information is displayed in three colors indicating "smooth (blue)," "busy (orange)" and "congested (red)." Initial service area only extends to 20 km around the center of Tokyo, Nagoya and Osaka, but the coverage will expand nationwide. The data is collected by Honda's "InterNavi Floating Car System", which apparently is installed on customer cars to track their data and share it with a central system. This probably gives very accurate real-time traffic data. But, I'm not sure whether that will be very popular in privacy-concerned countries. 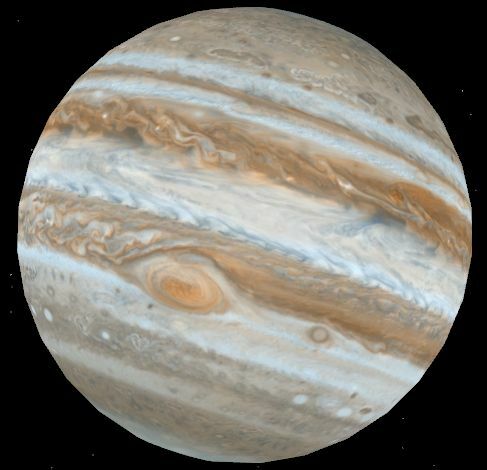 Apparently the system has already "collected data of total 100 million kilometers". Here is the source of the story (in Japanese). A couple of weeks ago the really nice Global Cloud Map I had written about last September stopped working. I contacted the author Chris Parsons, 'ChrisMDP' at the Google Earth Community, and found out he could no longer host it. This weekend I contacted some folks on the GE team and they were kind enough to host the image and code for us. 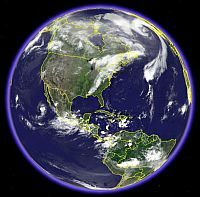 If you haven't seen this before, it is a near real-time representation of the entire globe of clouds (updated every 3 hours). 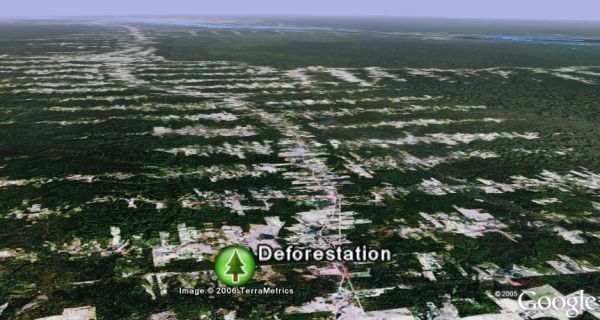 It makes Google Earth look like the real Earth from space. One thing that makes it nice is the satellite images are processed to put transparency where there are no clouds (so the Earth comes through clearly). Download the new Global Cloud Map now and enjoy! Here's 'ChrisMDP's new thread for the replacement version. 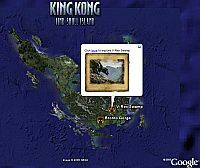 They call the game "Find Skull Island" based on the recent King Kong Movie directed by Peter Jackson. 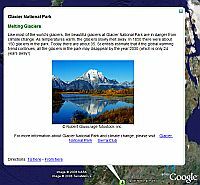 It is an excellent blend of a web site (in several languages) using Flash and Google Earth. The game has very well done graphics and uses clips, music and sounds from the movies. As you play along you get tasty morsels of downloads including "exclusive" unseen clips from the movie and wall papers. 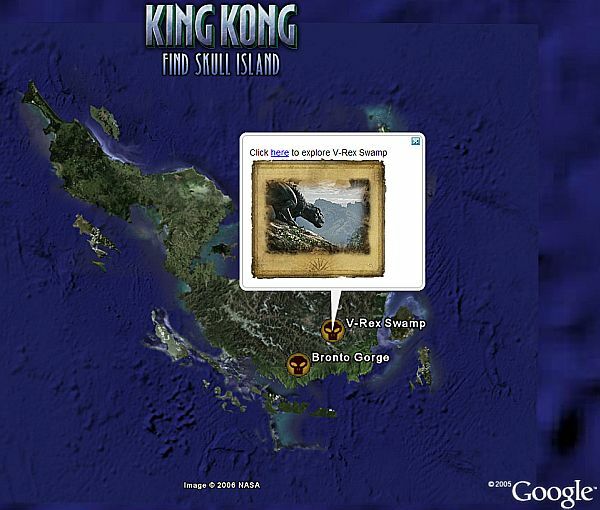 You also get placemarks and an image overlay of Skull Island somewhere in the ocean. After you get a few of the downloads and proceed to King Kong's lair, you have to buy the DVD from sendit.com to proceed further (they give you a code you have to enter to proceed). We are back from our skiing vacation in Utah. 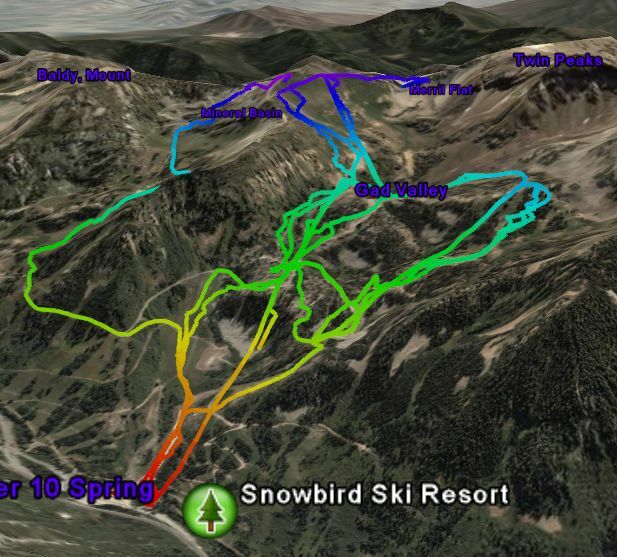 While we were skiing I took my trusty GPS along to track our paths along the slopes (and lifts). You can read my post from last week showing our skiing at Alta. We also did some skiing at Snowbird (just next door to Alta). 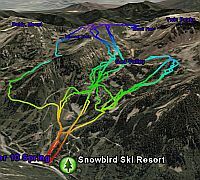 Again, I took my GPS tracks from Snowbird and converted them using the free GPSVisualizer to a KML file so you can view them in Google Earth. Here are the tracks which are colorized by altitude. The high resolution photos in Google Earth are from summer time, so you just have to imagine the amazing snow (we had over 30 inches of fresh powder during our stay). The straight lines are our going up the slopes on ski lifts. If you zoom in, you can see my tracks as I came down the mountains. You can also see where I left my GPS on while eating at the Midgab restaurant. We made a run at Mineral Basin, which is a bowl on the back side of the mountain. Beautiful views from the top (when the clouds are clear). Taking note of the date, Google released new high resolution imagery today of Area 51. It appears all the rumors are true about this "secret" military base. 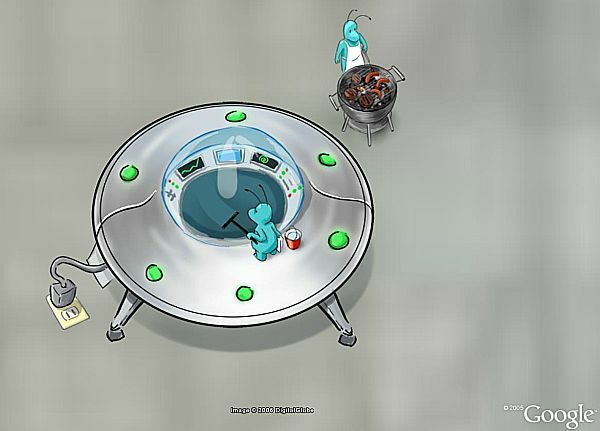 Not only are aliens visiting this place, they even stop for a BBQ! Check out this placemark . Or, you can just go to your Temporary Places folder and you will find a link to "friendly visitors". Via Kevin.Jarnot.com (top digg story of the day).